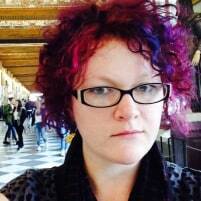 Lilly Ryan is a pen tester, Python wrangler, and recovering historian from Melbourne. She writes and speaks internationally about ethical software, social identities after death, security, and the telegraph. More recently she has researched the domestic use of arsenic in Victorian England, attempted urban camouflage, reverse engineered APIs, wielded the Oxford comma, and baked a really good lemon and coconut cake. If you’ve ever wanted an invisibility cloak, this talk is for you. Cameras peer at us from street corners, from phones, from the dashes of passing cars, and from shopping mall advertisements. Even when you’re not posing for a selfie, you might end up in the background of someone else’s picture while you’re out at dinner — and if that photograph is uploaded to a social media site, facial recognition can pick you out of the lineup. Machines are getting better at recognising our faces — but if you want to sneak through the streets of your city like a young wizard in the corridors after midnight, there is still hope. This talk provides an overview of the latest urban camouflage technology and how to deploy it in order to foil facial recognition. During this session, you’ll learn the ways machines “see” us, and how to play with them in order to become invisible. We’ll dive into the ethics of biometric identification. And, if you’re feeling adventurous, you can have fun with reflective tape and face paint to disguise yourselves from the algorithmic eye.